Evening before last, my husband picked up his phone and called Commander’s Palace to make a reservation for three to Saturday’s Jazz Brunch. Yes, 11:00 a.m. would be perfect, thank you. After they’d taken his name and signed the deal, he hung up with a somewhat shocked and slightly smug little look on his face. “What’s up? ?” I asked. “They welcomed me back,” he said. “I’m in their system…” I had to laugh, thinking of how far we’ve come. From homeless Denverites trapped in a smarmy hotel room in Metairie, to Lower Garden District denizens whose names are in the system at Commander’s Palace. I know, I know – it’s a computerized system and our name is in a database, kind of like our neighborhood Chinese place that we order delivery from sometimes that takes our phone number, pulls us up, and saves us time by not making us recite our address to them again. So don’t worry, we won’t let it get to our heads. 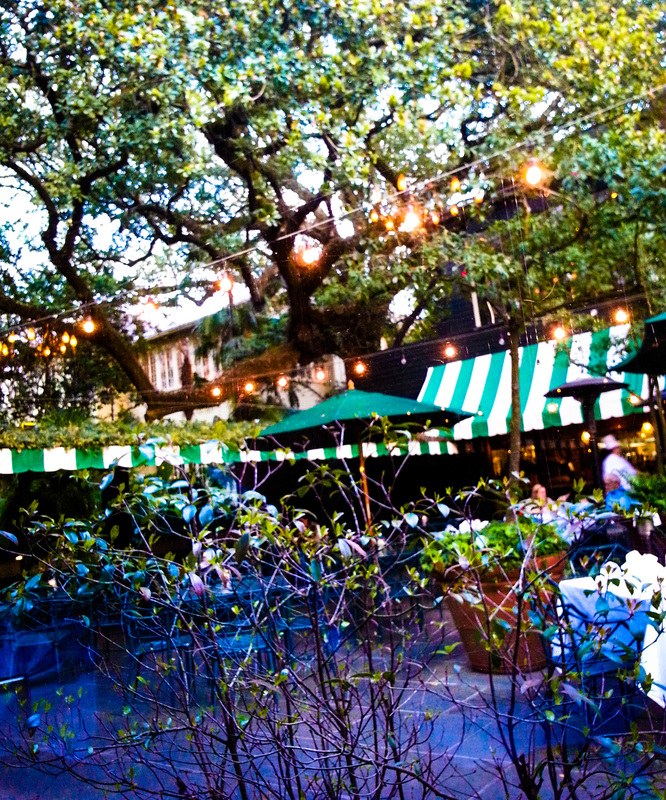 But, I must say, once one experiences the debonair treatment and divine cuisine of a New Orleans institution that has been around since 1880, one tends to become a little spoiled. Our spoiling began back in March, when I informed J that I wished to take him out to dinner for his birthday. “Pick any place you’d like,” I said, thinking of the vast array of amazing establishments this city contains and our Dine Out Wish List which is about 10 miles long. He thought about it for about three seconds, and replied, “Alright then, take me to Commander’s Palace.” My wallet gasped in momentary fear, before it realized it was no longer residing inside my purse on a chipped shelf in a smarmy hotel. I gleefully shouted, “OKAY!! !” and he set about making a reservation. This whole exchange took place about two days before his birthday. Attempting to make a reservation online, he was greeted with a “Sorry, no more room” by The System, so he called and played the Birthday Card. Thus, on a fine Wednesday evening in March, I found myself teeter-tottering in dress shoes up Coliseum to Commander’s Palace, which is a nice reasonable walking-distance away from our house. The first thing that blew my mind was the graciousness and the immediate feeling that everyone wanted us there. The multitude of staff voices saying “Welcome in” as we passed by on our path to the table. The pulling out of chairs and the unfurling of linen napkins (and offering darker linen to gentlemen wearing black trousers). The three or four staff members who work with one table. The presentation of each diner’s plate at the same time, even if it takes one dish per three people to set them on the table at the very same time. The class, the grace, the smoothness of a long, lingering meal. Laugher all around. No one is grumpy or sullen or frazzled or bored. Guests or wait-staff alike. And then there is the dining experience itself. The timing is perfect. You’re not cramming down a salad for fear of your entrée landing next to your elbow too quickly. J’s birthday dinner thus began languidly with a pre-dinner cocktail. 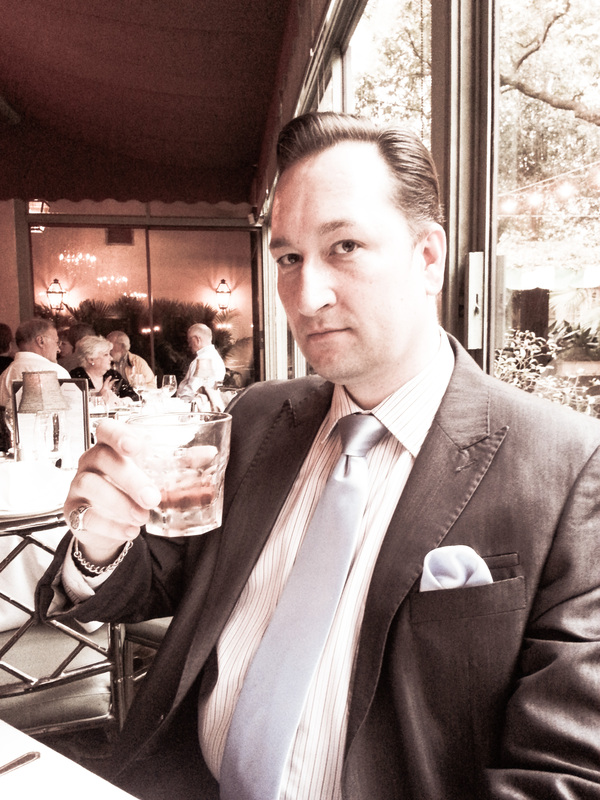 He, of course, had a Sazerac. I had this awesome thing involving champagne and thyme leaves. From there, we slowly spooned from perfect bowls of a bisque, and after a rest in between, I had flounder draped in an amazing beet sauce while he experienced quail for the first time. After our main courses, not too filling but leaving one perfectly satisfied, we finished up our glasses of wine while we awaited dessert. Now, since he had played the Birthday Card in order to secure a reservation at such late notice, we’d discovered, when we were seated, that they had honored the occasion by decorating our table with balloons. We thought that was very nice of them, and sat slowly digesting with no idea what was about to happen. When dessert arrived, our Bread Pudding Soufflés all puffed to perfection, J’s came out with a candle on it. And, ceremoniously, they placed a Commander’s birthday chef hat atop his head. I couldn’t stop laughing. We had no idea they do that for birthdays! As other diners filed into the room, he received a number of birthday wishes from perfect strangers. At that point, it was kind of hard to hide. I’m still laughing! Despite his stoic demeanor, however, J was delighted with his new chapeau. 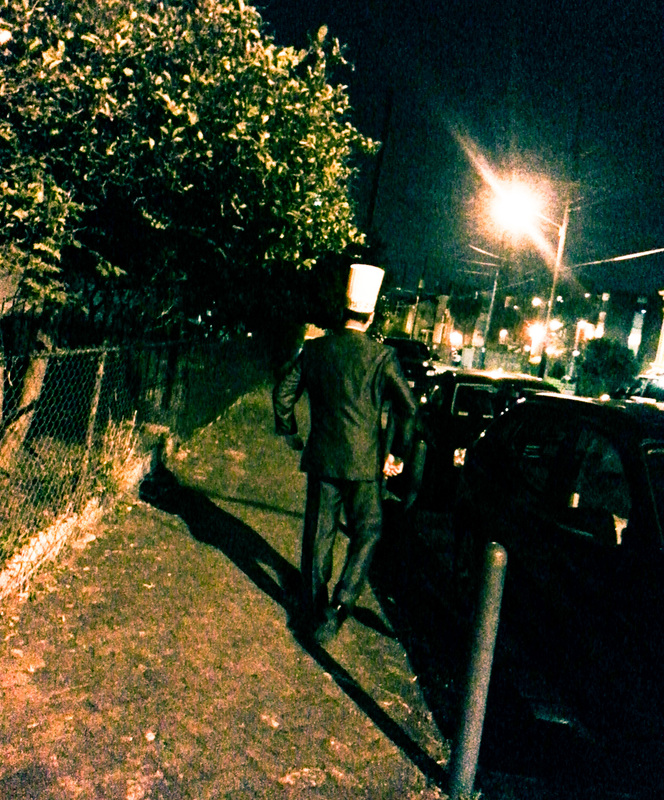 He danced all the way home in his chef hat. We now display it in our kitchen. That was the night we officially decided we had been spoiled to the point of no return. Granted, we have many MANY a place left on our dining list, including other classics like Galatoire’s, and the like, so we shall see. Nevertheless, every other upscale experience I’ve had so far at various places for events relating to work and such has left me pining for Commander’s perfection. 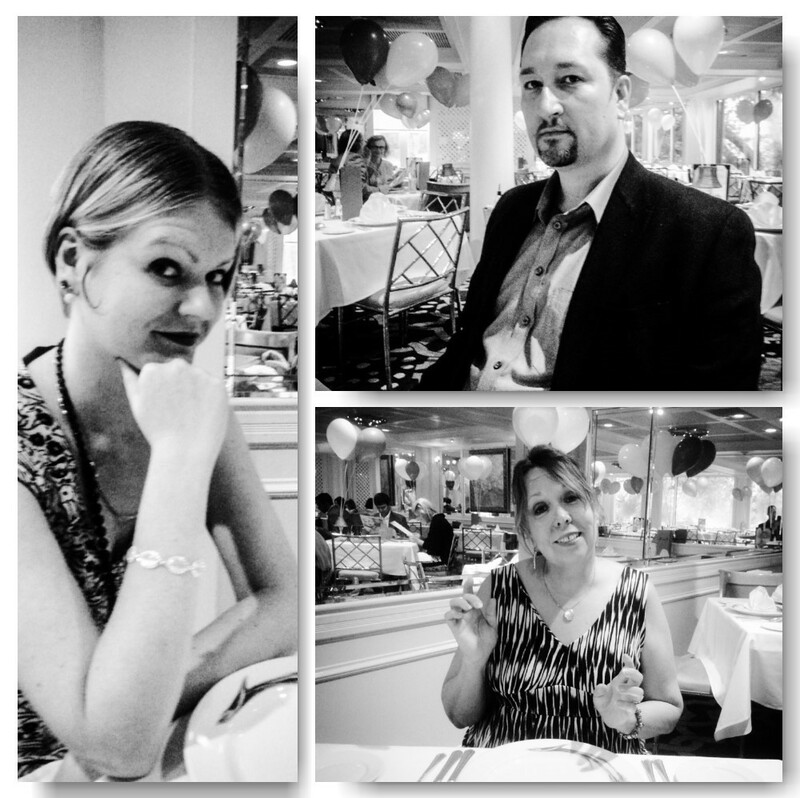 And so, today, we all gussied up and made our way to Commander’s. Luck was on our side with an amazingly placed parking spot right on Washington – we drove since the rain was pouring down a little too much to walk. None of wanted to stagger into the foyer looking like a drowned rat! Feeling all fancy when the Maître ‘D greeted us with a “Welcome back, Mr. Thomas,” we were led upstairs this time to a dining room overlooking the courtyard. 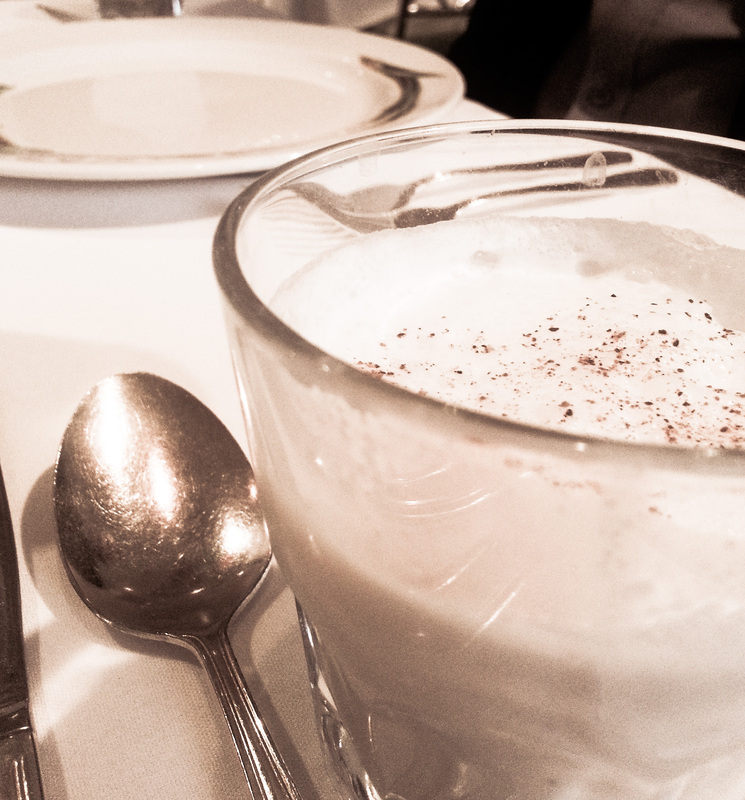 We began with a Brandy Milk Punch, which is perfectly breakfast-appropriate, as hey, it has milk in it. 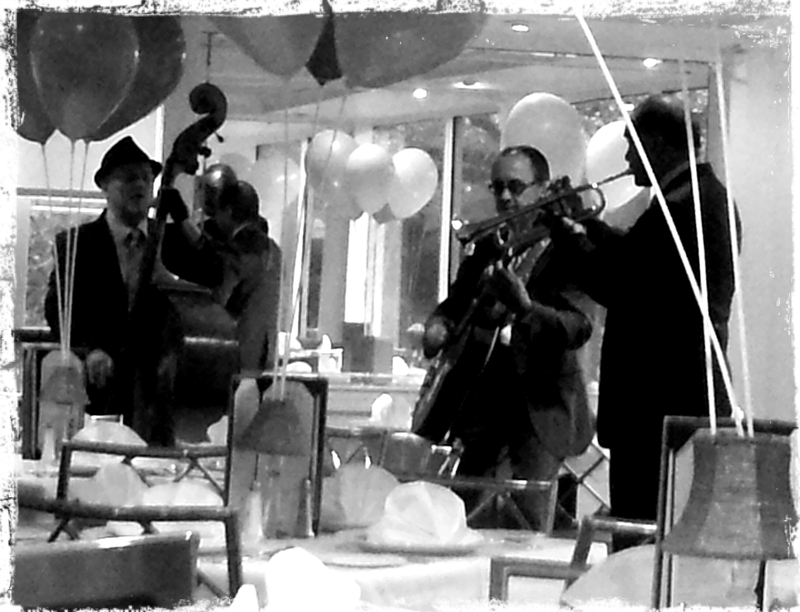 The musicians came up while we were sipping. They were, par for the course in this city, incredibly good. After a couple of tunes over in a corner, the combo set forth about the room, and played a request directly for each table. When they came to us, they played Sunny Side of the Street at my behest – mine and J’s wedding dance song. I had a nice arugula and peach salad to start, followed by a very decadent and very rich Cochon de Lait Eggs Benedict nested atop a cushion of cheddar/bacon biscuits. 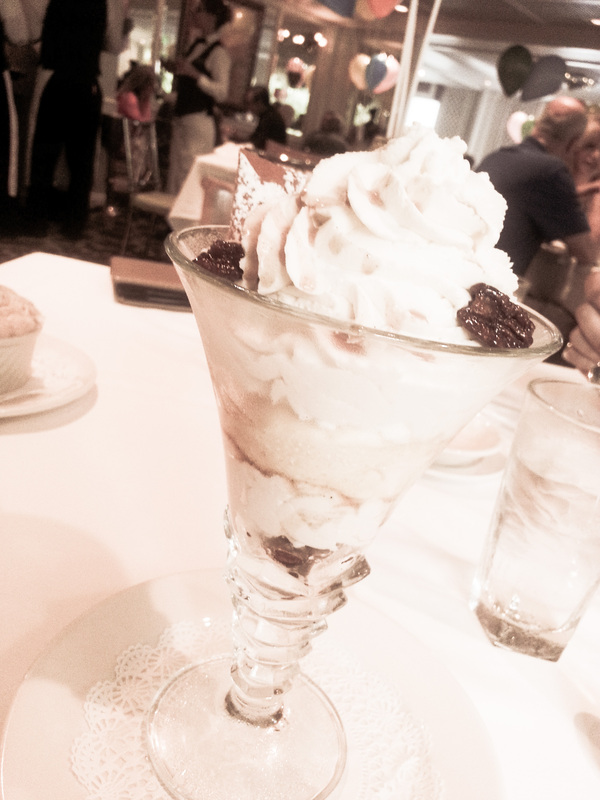 By this time, over an hour later, I was quite well-fed indeed when they brought my Praline Parfait out. I put up a good fight, and put down a little over half of this massive pecan-y delight before I had to concede defeat. Quite a number of hours later, on a lazy, rainy Saturday afternoon (going into evening), I am still riding on that Commander’s high. And, in short, feel like I never need to eat again! On a side-note for anyone who craves the Commander’s experience but may have a tight-ish travel budget, the Jazz Brunch is very reasonably priced and will not make your wallet curl up in a corner and sob. Even if it did, it would still be far worth it. I am already looking forward to the next occasion to be welcomed back.